Description: Coastal survey of Belfast Lough with Belfast in the lower left. Large vignette of Carrickfergus Castle. Description: Carlow Region. Decorative cartouche. Original colour. 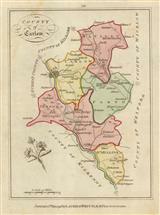 Description: County map of Carlow. Original colour. 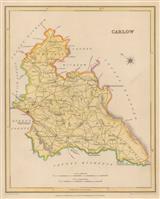 Description: County map of Carlow. Coloured. 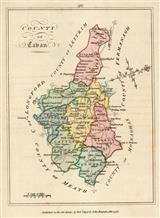 Description: Charming county map of Cavan marking major roads and settlements. Original colour. 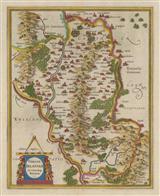 Description: The first printed map of the Kingdom of Connaught and the first printed plan of Galway. Superb impression of the rarest of all Speed's editions. Description: Miniature map of Connaught attributed to one of the most famous Dutch publishing houses in the Golden Age of Map Making. Coloured. Description: The old Irish Kingdom of Connaught, called a province on this map, detailing the west of the country from Galway Bay to Sligo Bay south to north and the Mullet Peninsula to Athlone west to east. Coloured. Description: Collins' important chart of Kinsale Harbour from the first English survey of the coasts of the United Kingdom. SL. Description: Chart of Dublin Bay including Howth Head, marking the town and Castle and various sandbanks. Description: Uncommon map of Dublin showing the city during a period of enormous expansion. First published in 1812, Corbet updated this map several times (in 1816, '20, and '26), a testament to the city's growth. Description: Elegant plan of Dublin, showing a comparison elevations of principal buildings within the city. Coloured. Description: Dublin and Kildare. Original hand colouring. Description: Attractive plan of Dublin with vignettes of Custom House, South Wall Lighthouse, Nelsons Column, Kings Bridge, Four Courts, and St. Patricks Cathedral. Coloured. Description: Dublin, with reference to institutions, transportation routes and historical features. Printed colour.